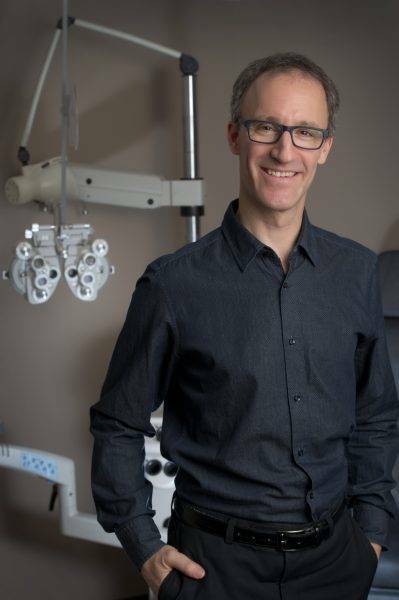 Howard graduated from the University of Waterloo, School of Optometry, in 1990 and was honoured with the Award of Merit from the Canadian Association of Optometrists. Howard is originally from Toronto, and has been practising in New Hamburg since 1991. Howard and Kim Dolman purchased the clinic in 1994 from Dr. Betty Fretz. Howard is a member of the Canadian Association of Optometrists, and the Ontario Association of Optometrists. He has volunteered at the F.I.S.H. Eye Clinic in Kingston, Jamaica. Howard has represented the province of Ontario on the National Public Education Committee, for the Canadian Association of Optometrists. He has acted as a clinical skills assessor for the Canadian Examiners in Optometry, and has spent many years serving as part time clinical faculty of the University of Waterloo, School of Optometry, as a supervisor of 4th year interns. In December 1999, Howard became the first optometrist to attend and participate in laser vision correction at the TLC London Laser Eye Centre. He holds a certificate in Advanced Ocular Disease and Therapeutics. His interests include children’s vision, visual perception testing, contact lenses (including night-wear ortho-k), and laser vision correction. Outside of the office, Howard continues to enjoy weekly hockey.